Internships, apprenticeships, and traineeships: People seeking work experience can apply for an internship position where they will receive important practical experience and on the job training. Internships are offered on a case by case basis. Traineeships can also be combined with our structured Instructor Training Courses. Send your detailed Resume when applying for an internship or traineeship position. What is a Traineeship? A traineeship is an education and training programme which incorporates work experience, preparing young people for their future careers by helping them to become ‘work ready’. Designed for people who don’t yet have the appropriate skills or experience, traineeships provide the essential skills, knowledge, and experience. What is the difference between a Traineeship, and Doing the Instructor training? The instructor training is open to anyone and is limited to the training course itself. People come to the courses with the expectation of eventually working elsewhere. The traineeship is for people with wan to live and work with us here on Maui. Traineeships are only available to people who are accepted into program as you will working alongside us daily and become a member of our team. A traineeship is available by “invitation” after your application is accepted. 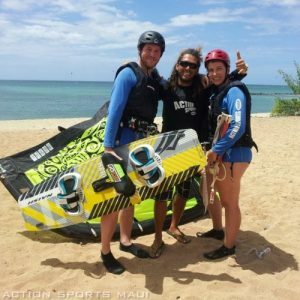 Train and Get Certified: Your internship can include valuable Certification and training with the worlds largest Kiteboarding Organization. We can arrange your certification courses while you are in training as you qualify for each step. Lifestyle: To live on Maui can be expensive, unless you plan to stay for a longer period. When you commit to a longer stay you can take advantage of many deals that make living expenses more affordable. Example; Long-term accommodation is much cheaper than short term, and learning to “live like a local”, can be much more economical and more affordable than living like a “tourist”. Our workers will have access to affordable long term accommodations, and cheap transport, as well as receive assistance in getting settled into the local lifestyle, quickly and easily. Being settled on Maui for a period of time is considered a plus because local knowledge is an important factor. Interested in Internship/traineeship? Send us your resume and tell us why you want to join the program.